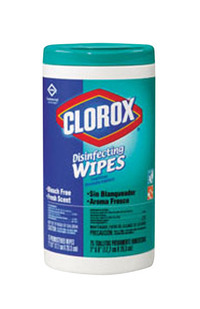 Clorox Fresh Scented Disinfecting Wipe Canister contains 35 wipes featuring bleach-free formula that kills 99.9% of bacteria including staph and salmonella. It is a one-step cleaning and disinfecting solution that is perfect for day care centers, offices, schools and restaurants. Quick, convenient pre-moistened individual wipe for cleaning hard surfaces comes in air-tight canister package that keeps it moist and effective. It is sold as 12 per case.